The isopach map of Seni (1981) shows thinning of the Paluxy over salt structures and thickening in areas away from the structures. 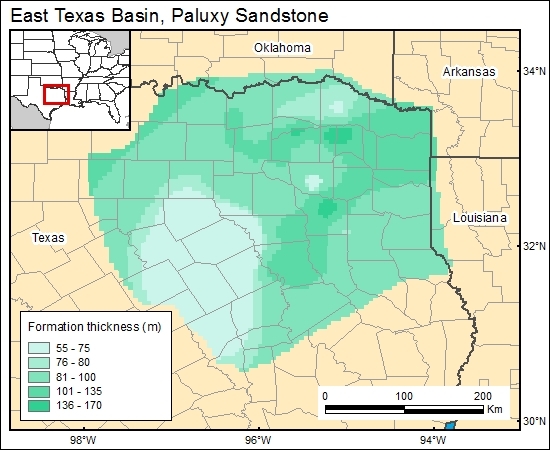 The formation-thickness isopach was gridded at 5-km cells (c3paluxyg). Seni, S. J., 1981, Depositional systems of the Lower Cretaceous Paluxy Formation, East Texas Basin, in Kreitler, C. W., Collins, E. W., Davidson, E. D., Jr., Dix, O. R., Donaldson, G. A., Dutton, S. P., Fogg, G. E., Giles, A. B., Harris, D. W., Jackson, M. P. A., Lopez, C. M., McGowen, M. K., Muehlberger, W. R., Pennington, W. D., Seni, S. J., Wood, D. H., and Wuerch, H. V., Geology and geohydrology of the East Texas Basin; a report on the progress of nuclear waste isolation feasibility studies: The University of Texas at Austin, Bureau of Economic Geology, Geological Circular 81-7, p. 12-20.